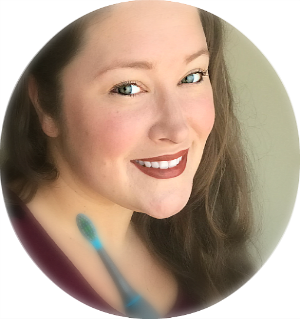 I received complimentary products from VTech in order to provide this review. All opinions are my own. When VTech contacted me about another review opportunity I was VERY excited. I think they are a great company that focus on fun AND education. This time around they wanted us to review toys more focused for toddlers even though my almost 4 year old daughter (when did that happen) is having fun with them as well. I have added ALL these toys to my Holiday Gift Guide because they make GREAT presents! 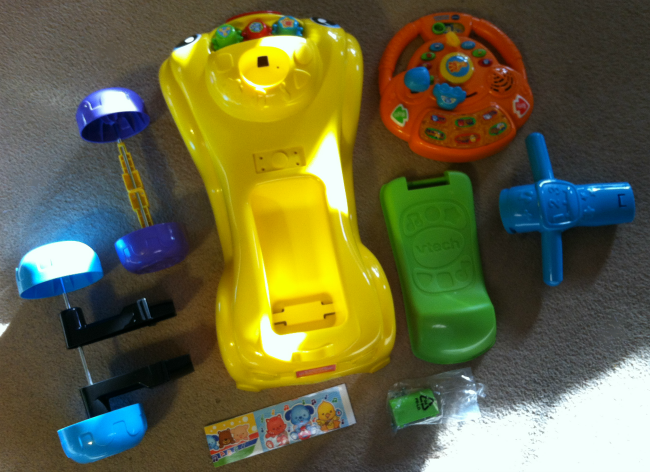 We received FOUR toys from VTech to review. So this review might get a little long, but there is an awesome giveaway at the end for one reader to win them all! Which means a GREAT Christmas gift! The first thing I noticed when opening each box was that each one came with a warranty registration which is so important because things break or incase of recalls. Kiddos can either play in food or counting mode and the dino responds with rewarding sounds and phrases all while introducing colors, numbers, shapes and more. Press the question button and kids can answer the dino’s questions to show what they’ve learned. Five shape buttons help kids learn shapes and numbers, while spinning the disc on dino’s back will play sing-along songs. The dino can also be pushed or pulled by a string for even more fun melodies. I'm not a fan of strings for babies, but this toy is technically of babies at least 12 months. My daughter loves pulling it along. We decided to save it for little man for his birthday because he is no where near ready to ride even though the interactive steering wheel features driving, learning and music modes with more than 80 songs, sounds and phrases that introduce animals, opposites and first words. You can also turn on the engine, move the gear shifter or press the horn to hear realistic driving sound effects. Children can pretend to drive to six different fun locations with arrow buttons teaching the concept of direction and road safety. Attach the steering wheel to the cruiser and it becomes a fun ride-on toy. The Sit-to-Stand Smart Cruiser also has a fun front activity panel and under seat storage children can fill with small toys for more fun on the go! I LOVE this one! I was a band geek and then a choir chick, so this is my favorite. It was easy to put together and only had three screws. It also came with batteries. 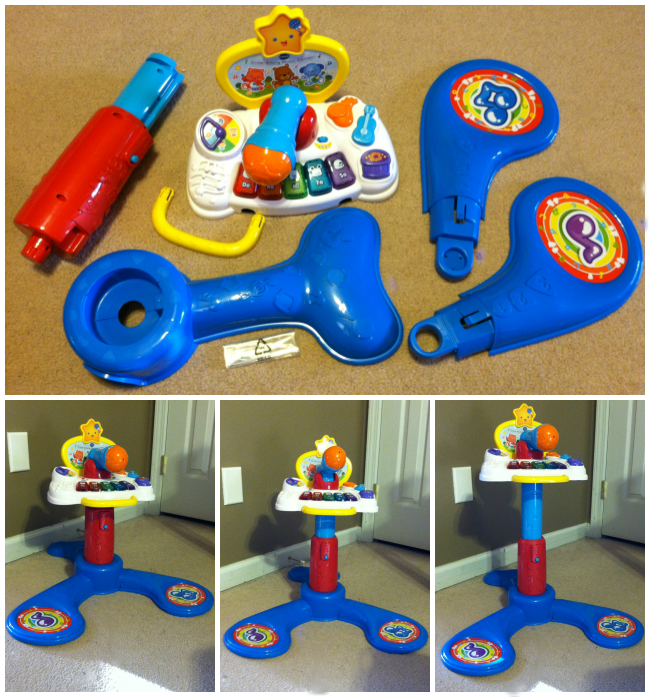 With the Grow-Along Music Center, children can pretend to be musicians and sing along to the music. As they sing into the microphone, five colorful lights correspond to children’s voices, or they can play with wacky voice-changing and amplifying effects. They can also rock out with three instrument buttons that play guitar, drum and saxophone sounds. Five animal piano keys introduce kids to instruments, colors and animals. Kids can choose between Learn & Play mode and Sing-Along mode to become learning super stars! It has different size settings so your little one can play at the perfect height. The top also comes off so they can play on the floor. Parents can cheer on their little sports stars with the Smart Shots Sports Center. This electronic sports center features a soccer goal and basketball hoop for a fun 2-in-1 experience also comes with both balls. Your kiddos can kick the soccer ball into the net to hear fun sounds or toss the basketball into the hoop and the magic sensor will count up to ten each time a basket is scored. Three buttons introduce shapes, numbers, opposites, sing-along songs and more. Turn the gears or flip the page to hear fun phrases and sounds. The sports center also features a light-up screen that plays a variety of fun animations and shows numbers, shapes and letters to reinforce learning. I'm giving this to both kiddos for Christmas because I think it could really help SweetPea with her large motor skills in a way where it isn't so hard for her. This toy wasn't too difficult to put together although it didn't come with batteries, but only requires double A's. Love your review. 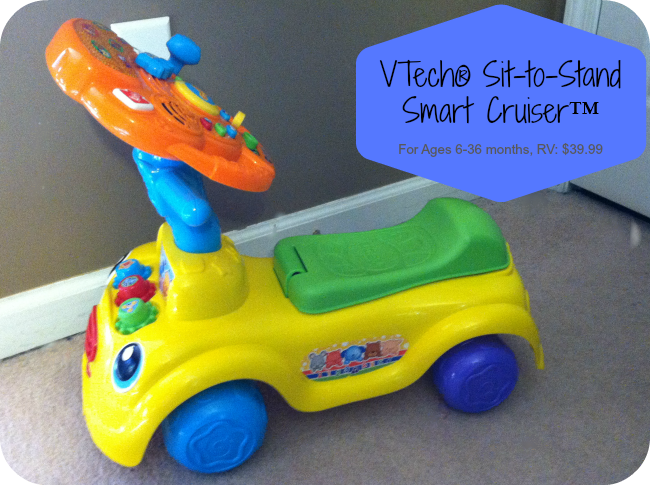 Vtech is one of my favorite brands for toys. All these toys look like SO much fun! I think my little ones would especially love the Smart Shots Sports Center. I'd love that Dino for our little one. One of my favorite youtube vloggers also has the sports one. They look like a ton of fun! These are amazing toys. If I win my twins will be so happy! I love VTech toys!! They stimulate the mind of our children and have fun toys too!! I love the review on these children's toys. My grandson would have a blast with these. 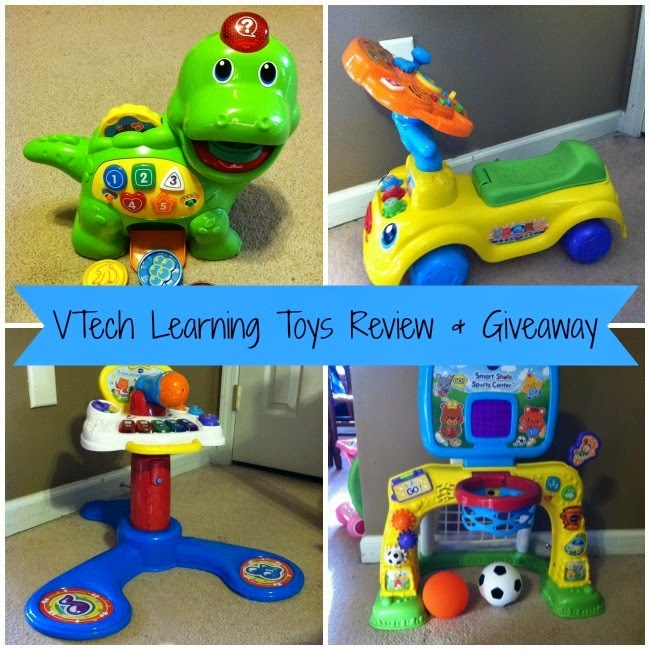 The review was right-on regarding VTech toys! I have bought a lot over the years for my kids & grandkids. We used to own something like the Chomp & Count Dino. I would get that toy again - it has all the bells & whistles that keep a tot busy for a while. I have not yet tried any VTech toys for my son but they look interesting. I've watched many reviews on YouTube (before I had sign in issues) and they look durable yet educational. Thank you for your review and thanks for hosting this giveaway. It's appreciated. What awesome prizes. These would be perfect Christmas gifts. I especially like the V-Tech Grow Along Music Center. I love every one of these fabulous toys! The Grow-Along Music Center is particularly appealing to me, as an amateur singer and musician. 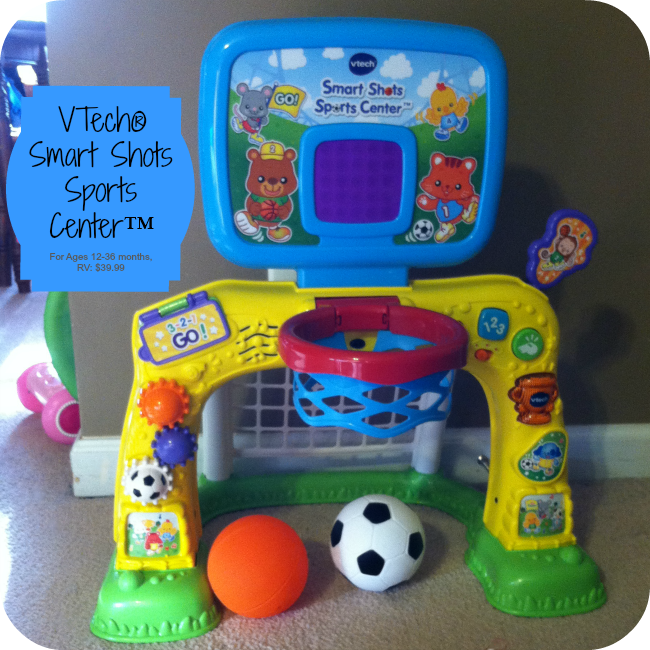 The Smart Shots Sport Center is my husband's favorite, as he is a basketball fanatic! VTech toys are awesome! I love that you can learn and have fun!! 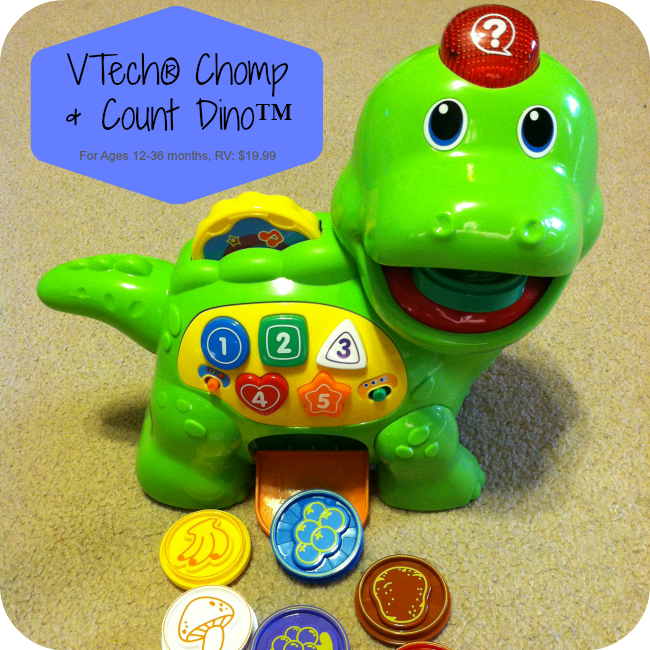 I loved VTech toys for my kids! I am going to be looking for gifts for my friends 2 year old and I love that dino! I love Vtech too! Looking forward to stocking up for the next little one. VTech has just awesoem educational toys for all age children and these VTech toys for babies and Toddlers are the best hands down! You can never go wrong by owning VTech! We've bought quite a few VTech toys over the years. The registration is great. Their toys are very durable too. I love VTech Toys. They are education. They are built to last and create hours of fun for our little ones. Vtech toys are the best. I absolutely love every single VTech toy that my daughter has owned. I have to agree with you, it doesn't matter the age, I swear they still love them!! I appreciate the review on these 4 particular toys because we do not own any of these, and Christmas is coming! We love VTech toys. They are so colorful, sturdy, and interactive! I love Vtech toys!!! I always feel good that my baby is learning as she plays! Great selection of toys.Very durable also. I think that sports center is really nice, my grandson would love this! All of our Vtech products last forever. I really love the Smart Shot Sport Center. We are definitely a VTech household. We love their quality and that the kids love them. As a mom of 5 kids under 10, we LOVE Vtech! The sports toys would be a huge hit in our house! My grandchildren love the Vtech toys. You did a great review on them. These toys all seem like my 2 year old son would love them! Thanks so much for hosting such an awesome giveaway! I like that the sit to Stand grows with your child. We love these toys they are so colorful and well made thanks for the informative review. I really think it is so cool they all come with a warranty on them. These are on my list for Christmas as well! 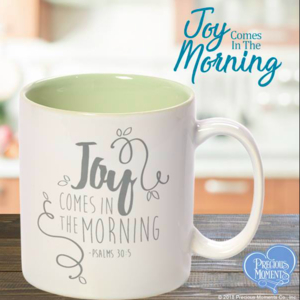 So many nieces and nephews now...any of these will make perfect Christmas gifts! I have never heard of Vtech before now. Great toys, great review! My son is grown and it has been many years since I have been in the market for kids toys. This is so helpful and these would be just perfect for the little "great" nieces and nephews that I am so luck to have! Great giveaway! Thanks so much for the chance. I love how versatile some of these toys are. They will last for a long time. Would love to win these for my daughter. I love Vtech toys! I just bought one baby phone for my little one, and he loves it! I love VTech toys. They have come such a long way since I was little. Those look like so much for for the kids. These are great teaching toys. These toys look like so much fun! I know that my son and my daughter (they are only a year apart) would have a blast with all 4 of them! Thanks for the review. I am glad to know that these toys will not only entertain my child but teach her as well. The soccer one with the counting sounds fantastic. Thanks for the review and the giveaway! All four toys look amazing! I especially love the dino one! I like that they are all interactive and learning toys! Thank you! I love how both education and fun these toys are. 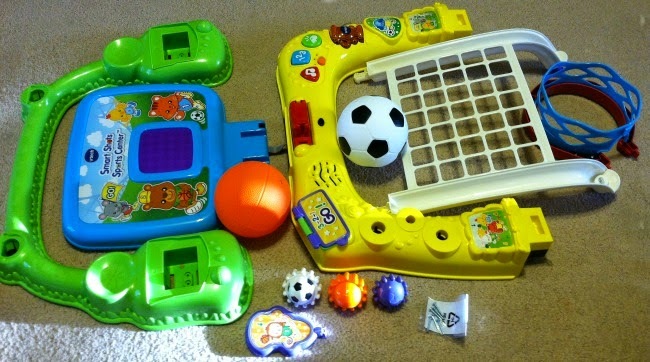 You can tell VTech really went above and beyond with these products. I also enjoyed how detailed and truthful your review was. Thanks for sharing! Love these toys. They will be great for my grandsons. Great review! Vtech products are wonderful quality and I trust the brand for my daughter. I love vTech products. Durable and kids have fun while learning! 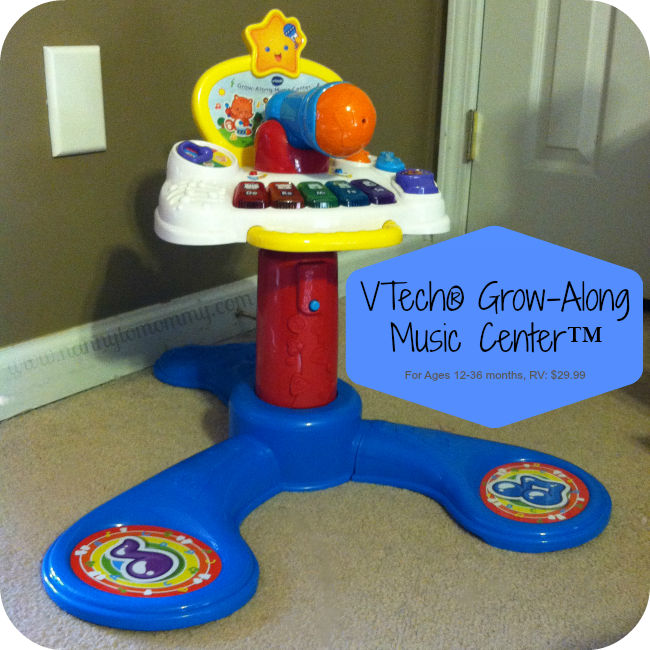 I think my favorite would be the VTech Grow - Along Music Center I could see my grand daughter putting on a concert for grandma lol ty for a through and wonderful review! great review. I love VTech products. 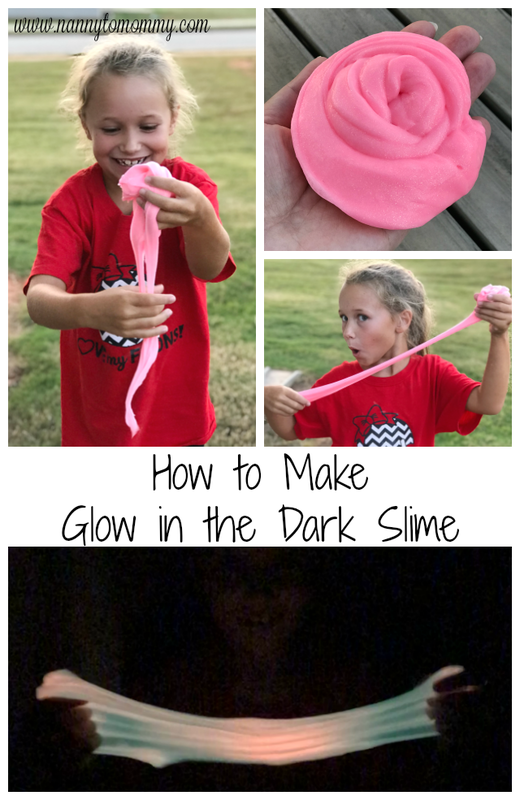 they are great to keep kids interested and active. I love how cute and adorable the colors is so bright. Thanks so much for the chance to win. These toys look so fun! Thanks for all of the information, wonderful review! I actually have the Sit-to-Stand Smart Cruiser on my wish list for my 9 month old. I love VTech toys! These are all really great. I love interactive toys and they're going to be the only thing I'll be buying my nephew this Christmas. The music center has to be my favorite because I am a complete music junkie/singer. That's one thing I know he has to have this year. Great reviews on these toys. My grandson would love the Sit-to-Stand Smart Cruiser! Thanks for the review, I love the V Tech toys. My grandson would enjoy all the toys especially the Grow-Along Music Center, he love to sing and would enjoy singing into the microphone. It's so cool that it has the colorful lights that correspond to their voices. These are great Christmas gift ideals. Great review and some fantastic toys for my great grandkids. Awesome giveaway, My grandson would love it. I basetball toy would be so much fun. Love all the bright colors, my daughter, or anyone's child, would love these! I love Vtech toys. My son would love this toys. He loves bright colors and music. Thanks for your review.